Planning for a long peaceful holiday, Getting confused where to plan the vacation Goa or Gokarna? Goa and Gokarna both the destinations are dazzling in their affluence of sandy beaches and blue water with beautiful landscapes. But picking the one which makes your vacation remarkable and giving you a blissful vacation is difficult to decide, Let’s look at the two gorgeous destinations and observe which go well in the best way for vacation. 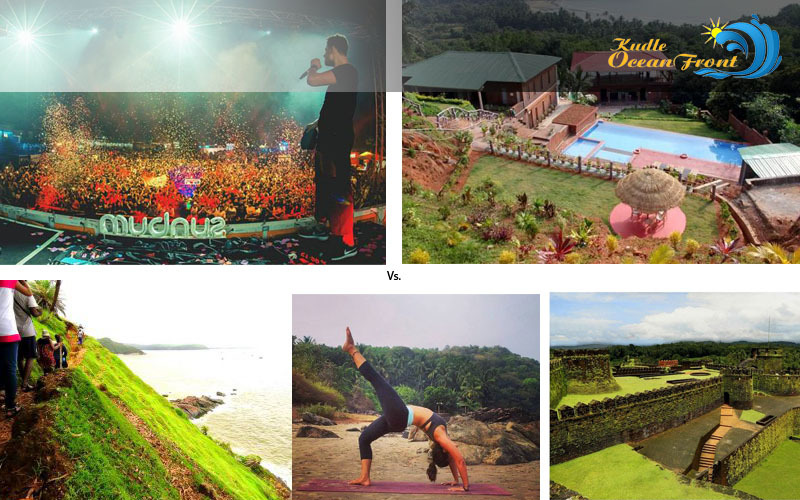 Which do you think is best Goa or Gokarna? As we all know Goa is famous for its beaches, recognized as the final destination for youngsters looking for alcohol, beaches, and loud parties. Whereas, on the other hand, Gokarna is becoming eminent breakout by attracting travelers across the globe. Absolutely, an ideal breakout for couples and people looking for solace and relax in the opportune atmosphere of Gokarna which is really admirable. I can say for sure there’s no paucity in water vastness and sandy beaches in both of the destinations. The shoreline of Goa is formed by famous beaches –Mandrem, Baga, Anjuna, Calangute and much more. Yet Gokarna has extraordinary beaches- Om, Halfmoon, Kudle, and Paradise beach. I see Goa beaches extremely crowded and shrill But, whereas Gokarna beaches are fairly soother, meek with fewer travelers. Goa: Here you’ll spot noisy crowd and alcohol parties. If you are planning a family vacation or you want to make a peaceful voyage with your spouse than North Goa beaches are the perfect destination for a peaceful vacation. If you wish to make your trip adventurous with friends and looking for parties, alcohol, and pubs, in that case, South Goa will be the absolute destination. Gokarna: Here you’ll feel the peace and tranquil. If you desire to take a relaxing holiday away from the noisy crowd and get rid of all your regular issues, for peace of mind, Gokarna is the exact destination, For tranquility of mind and soul visit Kudle and Om beach which are idyllic spots. If you like to visit more beaches plan a trek with your spouse or family and visit Half moon and Paradise beaches. To make the vacation exciting I suggest you, plan a trek to the beach passing through the rocky cliffs, Private inlets, and island and make your trip memorable. Goa: You’ll get more options for a comfy stay. As we witness Goa is a wonderful destination attracting a vast number of tourists across the globe from many countries throughout the year, So, Here we can get the luxurious hotels to the less priced hotels, you can opt the suitable one depending on your need. Gokarna: You can opt for the Homely resorts and pleasant hotels. Gokarna is just like Goa but it is gloomy. We can see there are amazing hotels and homely resorts but, it doesn’t offer luxurious hotels like Goa. Moreover, here you’ll observe various Gokarna Hotels among them there are budget hotels in Gokarna for your suitable stay. I would suggest making your stay at Kudle beach resorts and KudleOceanFront is the finest resort for a comfortable stay. Goa: Here you can obtain all sort of cuisines wheater its Russian or Chinese or continental, delicious seafood, You’ll get all kind of food here. Amigo’s near Nerul bridge provide the finest seafood, and Little Vagator is famous for its burgers and various restaurants and hotels are prominent in their cuisines. Gokarna: Here you can obtain south-Indian food and local cuisines with lusciously flavored Seafood. You can find hotels and restaurants special at their cuisines, some of them are Surya Café which offers delicious fry and curry(fish), Namaste Café is famous for its Tuna Sandwich etc. Goa: Get the unique experience of water sports in Goa. You’ll be excited by knowing the various sports accessible here, You can try Yachting, Water-Skiing, paddle boarding, scuba driving and many sports in which you can indulge and get great pleasure. Gokarna: Make your trip extraordinary by indulging in amazing sports here such as Beach football, Banana Boat Ride, Beach Volleyball and Parasailing you can even try Jet Skiing at Om beach.